Adobe Dreamweaver is an offline web building software, which was created with the needs of professionals in mind. The service allows launching and publishing dynamic websites of various complexity levels, providing rich feature set, quality templates that can be effectively customized with regard to your business needs and advanced functionality. Adobe Dreamweaver is mostly used by web design pros, who are involved in the development of complicated client projects. The website builder works well for launching different types of websites, but the major focus of the system is business websites. They generally have similar look, especially when designed by the same specialists. This makes the use of website builders a nice solution as these services allow building websites of a certain specialization much quicker than other web building tools. If you also belong to this category of users, keep reading the article to find out three popular contemporary services that are worth the attention. Thus, it is obvious that Wix, uKit and Mobirise are the best Adobe Dreamweaver alternatives, which are definitely worth trying, if you encounter problems, when working with the website builder. They offer flexible web design tools and cost-effective solutions that allow building different website types from scratch. Let’s find out now what exactly each system can offer. Wix has gained worldwide popularity due to its universal nature, abundance of features, template customization options and affordable pricing policy. The system can be equally used by non-techies, who are exploring all the intricacies of the web design process and web design pros, who have already developed multiple client projects and don’t wish to stop on their current achievements. By using Wix, you can launch any website types with no coding skills required. Blogging and eCommerce Engines, which help create functional and visually appealing blogs and online stores. In addition to multiple advantages, Wix is also known for its affordability. 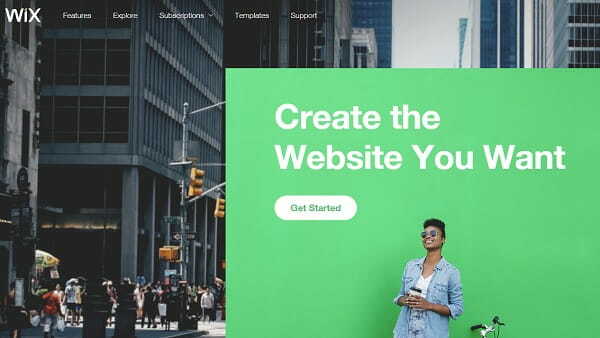 Currently, the website builder offers a free neverending plan and several paid solutions for complicated large-scale projects. These are Connect Domain ($4.50/mo), Combo ($8.50/mo), Unlimited ($12.50/mo), eCommerce ($16.50/mo) and VIP ($24.50/mo) plans. Each of them grants access to multiple options and tools, based on the feature set provided. See also: Wix Review – a detailed research of Wix website builder. When it comes to the cheapest and the easiest website builder, uKit is on the top of the list. The system has gained nice reputation as a small business website builder as it provides a powerful feature set needed to establish reliable web presence for any business. The website builder is so easy-to-use and understandable that even a novice with zero web design skills will master it in a couple of hours. Affiliate Program – the partnership program will become an extra bonus for web designers, who decide to join it as it grants an opportunity to get around 30% of all user payments for as long as needed, get quick access to website analytics system, tech support and other benefits. One of the undeniable uKit advantages is certainly its cost. You won’t find a cheaper option in the contemporary web building niche. 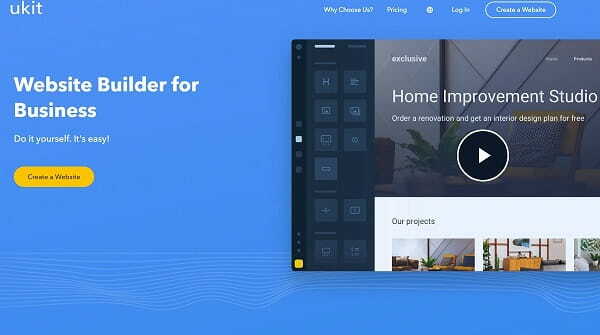 The website builder has a free 14-day trial period, which is more than enough to test its feature set. It also offers four paid options, the cost of which will be a pleasant surprise for you. Paid plans include Premium ($4/month), Premium+ ($8/month), eCommerce ($9.6/month) and Pro ($12/month) plans. Thus, if you lack the budget, uKit is certainly the service to use. See also: uKit Review – a detailed research of uKit website builder. Mobirise is an offline web building software, which requires preliminary download and installation. The website builder is easy-to-use for all user categories. Whether you are a newbie or a web design expert, launching a project with Mobirise won’t take much effort and time. With Mobirise, you can build quality portfolios, business websites, landing pages etc. Several Hosting Options – you can host your ready made website at a local server or web resources like GitHub, Google Drive, Amazon S3 etc. Free Extensions – the website builder comes with a set of extensions, such as Twitter Feed, Dropdown Menu, Facebook Comments, Cookies Alert, Google Analytics, Soundcloud etc., which allow embedding multiple website elements. GitHub Website Hosting – the option lets you publish and host websites, which will eventually diminish the final cost of a project for your clients (this will be a notable competitive advantage for you). Mobirise is a free web building software, irrespective of the purpose you will use it for. If you need to give your website more advanced functionality and outstanding design, you may consider using paid extensions like PayPal Shopping Cart, WOW Slider, Code Editor, Icons etc. You may additionally have to pay for hosting (except for that offered by GitHub Pages) and domain name. See also: Mobirise Review – a detailed research of Mobirise website builder software. Adobe Dreamweaver is a decent web building software, the feature set and advanced design customization tools of which allow creating professional business websites. Users, who regularly work on the development of full-featured client projects, however, often face the necessity to complete them within specified deadlines without affecting website quality. This is where decent Adobe Dreamweaver alternatives like Wix, uKit and Mobirise come into play. Wix is a quality universal website builder, which can cover the prevailing amount of professional web design needs, providing an extensive feature set and affordable pricing options. uKit is the easiest and the most convenient service for users with diverse web building background. It is also the cheapest one. Mobirise is a free web building software, which ensures ease-of-use and convenience. Its block-based structure, multiple hosting options and versatility of design customization tools make the website builder rank high. The choice is actually a decent one. So, take your time to select the best solution to come up to your web design needs.